After a promising start to the greens aerification processs yesterday, in which we were able to get half of the greens punched, we certainly ran into a bit of a roadblock today. The morning started out just fine, in which the sun peeked through, and we had started to harvest the remaining cores lying on greens 16 to 18 first thing today. However, within the first hour of us being out there, that 30% chance of rain in the forecast turned into a 100% chance of solid, steady rain for a couple of hours. As it started to rain, we had verticut and dragged all three of these greens, and were in the process on #16 of cleaning the remaining thatch. Of course, rain+sand = mud. Pictured above is Clyde and Claude making progress on 16 green. ﻿And finally above is a picture of 18 green cleaned off. 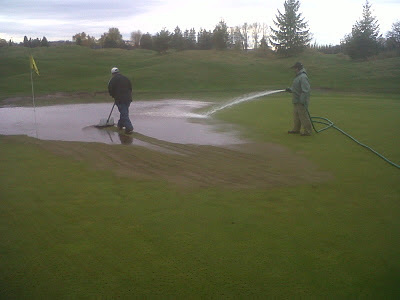 Make no mistake about it; this was not the ideal way of cleaning off a green, and it certainly what we had in mind when planning this venture. We still have some cleanup of the collars to do as you can see, but we should be able to get this tidied up by noon tomorrow. At the end of the day, we need to roll with the punches Mother Nature throws at us, and work with her the best that we can. So where does this put as as far as completing the greens aerification is concerned? Well, to be honest, I really don't know. We now are staring down the fact that we are going to have to topdress a lot heavier than we had anticipated as we can no longer use the sand extracted from the aerification process. And with the forecast showing more rain tonight and tomorrow, I'm really not sure how this will happen until at least next week. At the current moment we have two greens (8 and 9) which have been punched, and not cleaned off yet as well. The only good news with this, is the fact that we have yet to touch them whatsoever, and they should shovel clean a lot easier. But, to give a firm day or time when we will be done is tough to do right now. For now, the back 9 will re-open tomorrow morning for play. 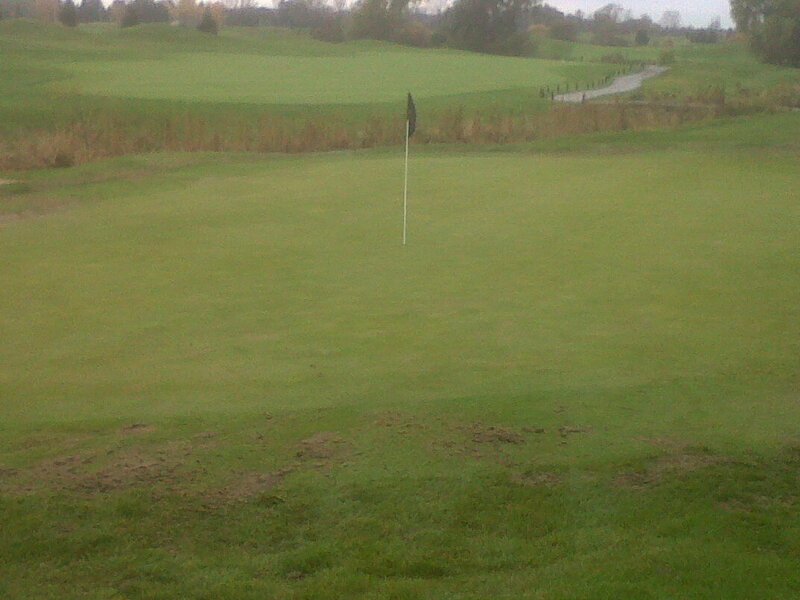 The greens will certainly not be optimal, and will play especially wet now, but at least will be playable. We will close the front 9 as of tomorrow, and hope that we can get through the aerification of them by the end of the week. I will keep you updated, but for now, let's hope for some sunshine!